Ten tips for increasing your charity’s impact by telling great stories. Before a charity puts anything on their website, writes a press release, posts on Facebook or communicates with their supporters in any other way, they should ask themselves one very important question, “So What?”. We’re all very wrapped up in the work our organisations do and assume they must also be fascinating to others, but if you want your intended audience to care about what you are trying to tell them, ask yourself that question, and then tell them a great story about why they should care. Think about the greatest stories told in books, films and TV; they all have certain things in common, great characters, use of emotion and the journey the story and its characters take. You may ask, what do great literature or the best TV shows have in common with your stories? But if you keep in mind those three things, great characters, a journey and emotion, your stories will have much more impact. It’s very easy to explain what your organization does and what projects you run, but it’s much more effective and memorable to tell stories about who you are benefitting and how you have changed lives. Think about great characters and build them into your press releases films and websites. Shaw Trust, work with ex drug users and criminals to help them turn their lives around and get back into employment. This page on their website tells stories of some of the people they have helped, allowing prospective supporters and employers to relate to them better. Great stories are about interesting people. Find great characters and tell their stories. Paint a picture with words about how their life has changed because of your help. This Pearls of Wisdom campaign from Jewish Care, brings to life the great work they do with elderly people. Rather than listing their services and describing their day centres and care homes, they put the people they work with front and centre and make their supporters relate to them and their stories. 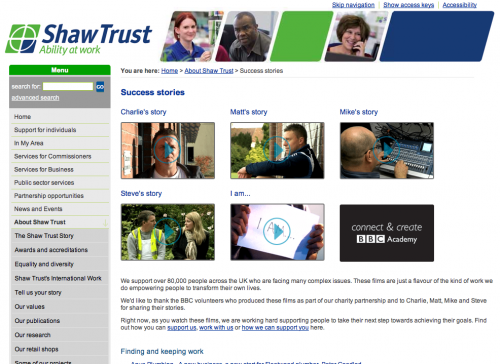 The Shaw Trust films take you on a clear journey through how Shaw Trust has helped Steve, Charlie and Matt. As potential supporters or donors, this journey helps you understand what the charity is doing and its impact. Jewish Care use their Pearls of Wisdom campaign across their website, Facebook, Twitter and in communications with donors. Try and stick to one clear message to help your supporters get your story. Make it clear what you want them to do, is it to give money, volunteer or just to know more about your cause? People will care more if you make them feel something through your stories, it doesn’t matter if you make them feel happy or sad, but making them feel something is essential. Cancer research does a great job here of both telling personal stories and making you feel something when you watch the stories of people they have helped. Carolan Davidge, Director of Communications at Cancer Research UK explains the difference that was made when CRUK started telling stories. Bronx Zoo use humour to great effect. True human interest stories will engage your potential supporters and bring to life what you do. Oxfam American bring to life their work by having one young supporter tell his story in his own words. Spend time talking to potential case studies for stories, and really listening to them by asking thoughtful, open questions. It’s when you really spend time, and really listen that the little details come out, those little nuggets of gold that make the stories even more memorable and personal. If possible talk to people face to face or on the phone, make good notes. Involve the people at the grass roots in your organization in collecting stories. They know what’s going on out there and who has great stories. Set up a system to collect and file those stories and collect contact info from relevant people. 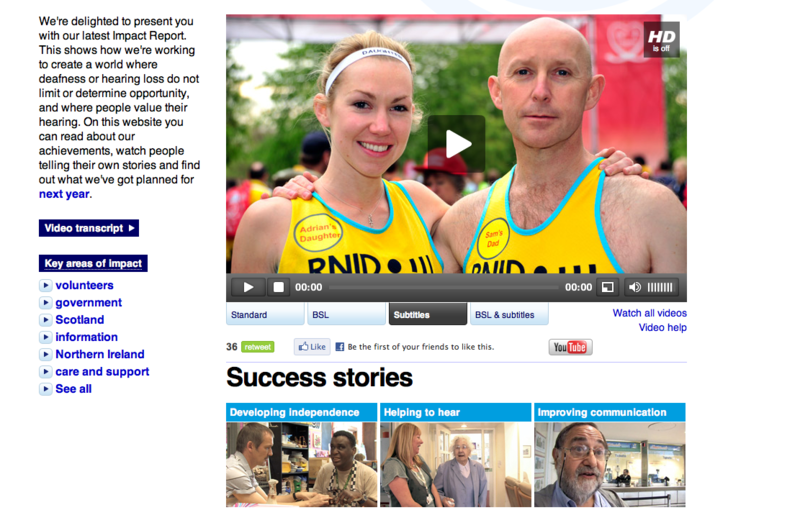 Cancer Research has established a system on their website to encourage people they have helped to send in their stories. If you ask all of these questions, you’ll definitely make sure you get all the details you need and that a Journalist will need if you want to offer your story to the press. Get used to thinking in stories when you are writing annual reports, for your website or for e-newsletters. Tell stories about people, not lists of facts. If you’re writing a press release, include a case study to bring the story to life for the journalist. Annual reports are also a great place to tell your stories, RNID do a great job here of showing the impact of their work in visual terms through personal stories, photos and vide. I know I started with this point, but I think it’s worth repeating! Ask yourself why someone should care about the story you are telling them. Think about what will make them care, can you make it more personal, more emotional or just more interesting?